Opening hours of the London Eye vary between 10am and 9:30pm depending on the season. Best time for the London Eye experience is in the morning and late afternoon. We are comparing London Eye 4D Experience Tickets Prices from leading ticket suppliers and Try to find you Cheap tickets prices on the market. The Coca-Cola London Eye experience is both an entertaining and thrilling activity that allows you to observe the skyline of London. 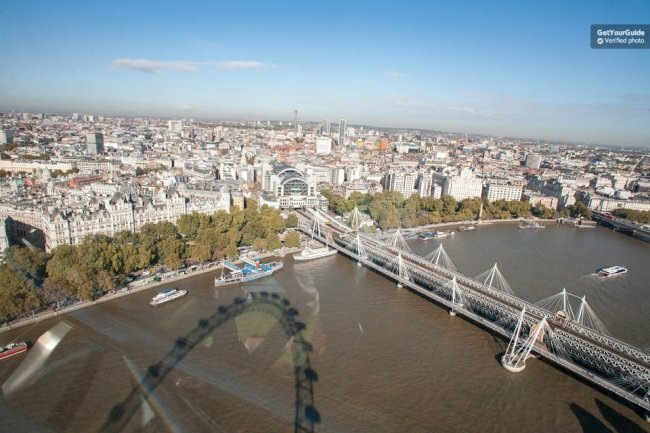 Besides the cityscape of the United Kingdom's capital, the view will encompass a much wider area once you reach the top height of the 30-minute rotation. In addition to the city panorama, you can see as far as the English Channel, distant airports and maybe even the edged of the European continent on a clear day. The rotation leaves you enough time to locate and admire points of interest of the British capital city. Among everything else, you will see the River Thames, the Tower of London, the Westminster Abbey, the Saint Paul's Cathedral, the Houses of Parliament and other iconic landmarks. In addition, you will enjoy an interesting 4D presentation of the city of London. This activity is ideal for everyone who isn't afraid of heights. The ride on this Ferris Wheel offers extraordinary photo opportunities. Your Experience With London Eye 4D Experience Tickets? Get into an enclosed glass capsule of the tallest Ferris Wheel in Europe and have a look at the cityscape of the capital of the United Kingdom. Enjoy extraordinary panoramic views of the city, its landmarks and the River Thames. Once you are at the highest altitude, you will see a wider area around London and much farther. Once at the top, you will have a view of La Manche and several significant city landmarks. During the 30-minute ride, you will have great opportunities to examine the Houses of Parliament, Big Ben, Saint Paul's Cathedral, many of city Londons famous bridges and much more. As a prelude, enjoy the 4D experience that enlivens the city of London by means of various effects. Benefit of the priority entrance and save yourself a lot of time by skipping the line to this very popular London attraction. What London Eye 4D Experience Tickets Includes? Standard ticket or the fast-track entrance ticket (depending on option selected). Visit the interactive 4D experience. It is usually possible to book your London Eye ticket up to a few days in advance. Hence, check out the weather forecast to make sure to have the best possible views. While the standard ticket is cheaper, the fast track ticket saves you potentially long queuing time to enter the London Eye. Travelers Reviews about London Eye 4D Experience Tickets? Travelers rate this popular activity with 4.5 out of 5 on TripAdvisor, Get Your Guide and Viator. Unlike what you may expect by lines in front of the entrance, sightseeing capsules aren't crowded at all. Also, people that booked the fast track entry are generally satisfied with the speed of the entry procedure. The London Eye Ferris Wheel is accessible to wheelchair users. You need to present the printed voucher to take part in the ride. Depending on the provider you choose, you may cancel your order and receive a refund. You can exchange your voucher for this activity at London Eye's collection points. Children under 3 years of age don't pay for the ticket, but you need to reserve tickets for them. Your voucher is valid for 7 days. London Eye Address: Riverside Building, County Hall, Westminster Bridge Rd London.